Each morning the Campers gather for a 30 minute full group warm up that includes aerobic exercise and stretching. After warm-up campers are divided into groups of 8-10 per coach and will stay with the same morning coach and group all week. 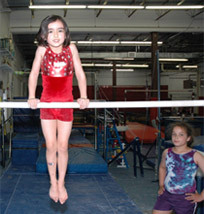 Throughout the camp week the campers learn progressive gymnastics skills on all of the four Olympic events: vault, bars, balance beam, and floor exercise. 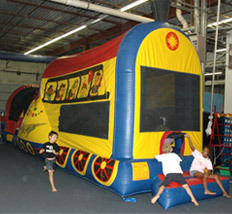 In addition we incorporate other fun equipment: Tumble Trak, Double Mini, Olympic Competitive Trampolines, Rings, Zip Line and Rope. 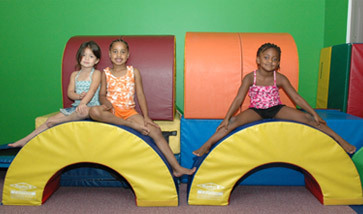 Beyond gymnastics, children practice how to stay in line, take turns, and follow instructions from the coach.